I saw that quote soon after I found out that the Apple co-founder and former CEO was dead. Atala was the one that gave me the news, and also showed me the quote on Stack Overflow, one of his favorite websites. We did the rest of the rounds together, Slashdot, Mashable, Huffington Post, they were all reporting on his death. I was also all over the news on TV. Another quote caught my eye on Politico.com sending me on a search for Jobs 2005 commencement speech at Stanford, and I was really touched. He was just 56. May his soul rest in peace. I'm always inspired by people who follow their dream, and who pursue it, and make a good example of it. Steve Jobs is one of those people. I'm not a big fan of Apple products, and I only used Mac in the school library. I had an ipod once but I gave it away when I got a phone that was an mp3 player. 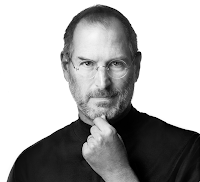 The biggest way that Steve Jobs touched my life was through his animation company Pixar, and the movies they created. I love cartoons, and last year, Toy Story 3 was among my greatest movies. I have been to two Pixar exhibitions, one in Edinburgh and another in New York, and each time, I marveled at the genuis of Steve Jobs and the artists he worked with. As I read various reports of his life and death, I couldn't help feeling a sense of loss. I'll leave you with some more quotes from the above mentioned speech. Find the full text on the Stanford website and watch the video on Youtube.